TITANIC: History's Most Famous Ship: 1898: Futility: A Warning? I've been interested in the Titanic since its discovery in 1985. I was only 2 years old, but I can vaguely remember the television broadcasts and how the world was caught up in it. I've been studying the Titanic since 1997, but after all these years something still baffles me. A book. This book was written in 1898 by Morgan Robertson. Robertson was a writer and a self proclaimed psychic. 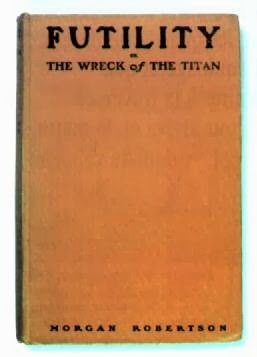 His book was entitled "Futility or The Wreck of the Titan". He tells of "Titan" a huge ocean liner that strikes a north Atlantic iceberg and sinks with everyone on board. The size, speed, and fate of his ship are strangely similar to Titanic. You must remember that this book was written in 1898 and White Star didn't start building Titanic until 11 years later in March, 1909. Futility is still available and is a must have for a Titanic collector.